It has been over 40 years since the civil rights leader Martin Luther King Jr. was assassinated but the fight against racism still continues today. The civil rights movement was arguably the most important factor in establishing equal rights for all citizens but there are still those who oppose these basic human rights. The civil rights movement struggled for years simply to gain rights for African-Americans that existed for white citizens. The movement fought for the right to apply for employment without fear of discrimination or to sit in a restaurant without segregation. These civil rights did not come without bloodshed on the part of civil right activists or the African-American people. African-Americans had fought in wars defending America only to come home and be treated as second class citizens. The civil rights movement changed this, and freedom from discrimination came to pass with the Civil Rights Act 1964. It is a testament to how far we have come as an equal society that we now have the first black president in the United States. Without the civil rights movement and the actions and efforts of the African-American freedom fighters it is doubtful that this would have been possible so soon. President Barack Obama is part of the legacy of the civil rights movement. The movement opened doors and paved the way for generations of African-Americans to be afforded the same freedom and equality as any other citizen. It has been just over 40 years since the Civil Rights Act 1964 was passed and even then there was strong opposition to this legislation. Racism was not simply wiped out because the Civil Rights Act 1964 came into being; it still existed then and it still exists today. But the act made sure that there would be legal consequences to those that practice discrimination or prejudice due to colour, ethnicity, gender, sexuality or country of origin. The act is thought of as one of the most important legal documents in American history. Racism has of course not been wiped out completely. President Obama has to stand behind bullet proof plexi-glass when he addresses the nation due to death threats made against him. There is still a large amount of racist organisations operating in the world today. Organisations such as the Ku Klux Klan and the British National Party still have extremely strong followings. Most countries will have their own racist parties operating under nationalistic and political guises. However, for every racist organisation there are countless anti-racism organisations that are dedicated to fighting racism and prejudice. There are a number of ways that racial discrimination can occur in today’s society and all of them are unlawful. Racial discrimination can be found if someone discriminates against another because of colour, race, nationality, ethnicity or national origins. Discrimination is unlawful on the grounds of race when it comes to employment, education, the provision of services and goods, housing, and services and activities carried out by public authorities. Grievance procedures and legal action can be taken against any individual or organisation that uses racial discrimination. The civil rights movement was a struggle to afford people today the rights that were unavailable to many only 40 years ago. Today, most of us in the western world can take these rights for granted but the fight against racism is still not over. Hopefully we are a more equal society thanks to the actions and efforts of the people involved in the civil rights movement. 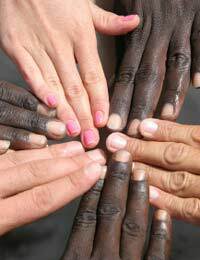 However, racial prejudice is still with us and reported in the media on a daily basis. The ability to see each person as an individual with rights and to accept everyone as an equal regardless of colour or race will help towards winning the fight against racism. i really like this website. It really helps me understand civil rights in history better. Also, this shows that racism should not be allowed and i just want to thank you for this very informational website. Is anyone willing to do an interview for me as I need to do on for my reaserch project! The question is "Is racism the main cause of violence in America today?" What are some of your recent accomplishments? Why isn't Malcom X mentioned in this article? He also had a part to play in the Civil Rights Movement. He may have supported violence but that does not warrant his omission from this article. I like what you are doing, in fact we should do the same avery where, people think that racism is a problem for countries like US OR INGLAND, but in latin america racist are the worst, they work the people´s mind sience child hood to make them think that if you are not white you are inferior and you need to serve the white, if you are black specificly, you are not even able to think, I´ve live this here in Dominican republic, where most of the people are black but have inferiority complex, this society is a froud, the goverment is trying to deny it every time they are accused by foreing organizations but it´s true just have to take a look on the comercials, I hope that this may lead to something and that you work help us here.